So... today I forgot to bring my packed lunch, as one does after long nights of blogging (or gaming). 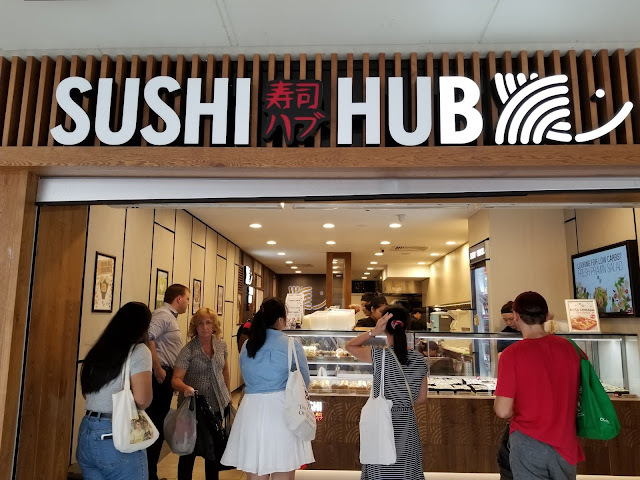 Walking out to pick up a new dress from my beloved Uniqlo, I couldn't help but notice the small crowd of people outside of Sushi Hub. 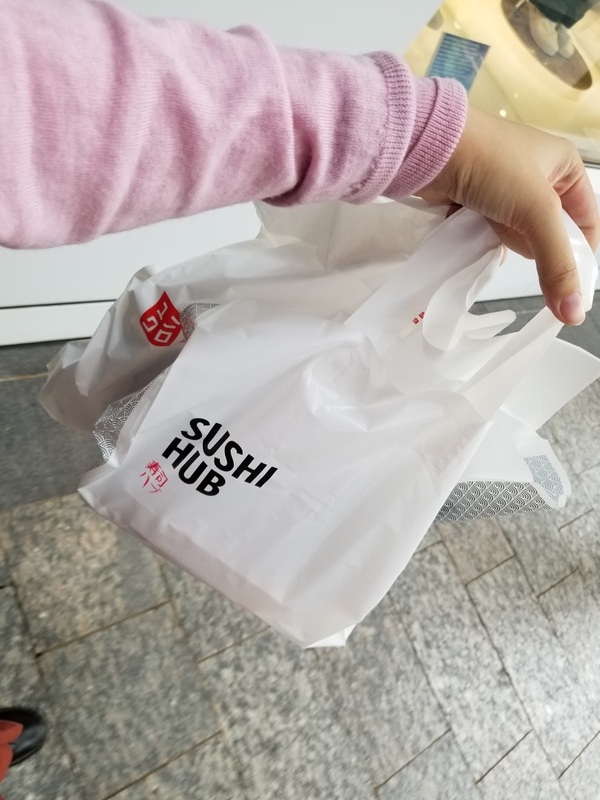 Obeying my grumbling tummy, I joined the queue. 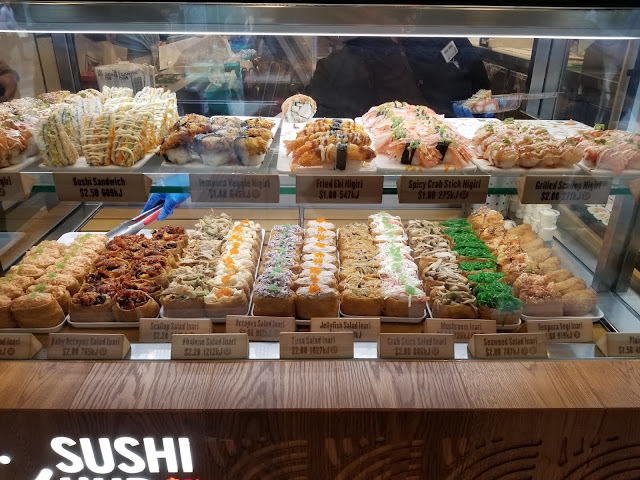 Other than the standard sushi rolls, I was quite keen to see there were other nigiri, inari and sushi sandwich options, which is of course what I went for. 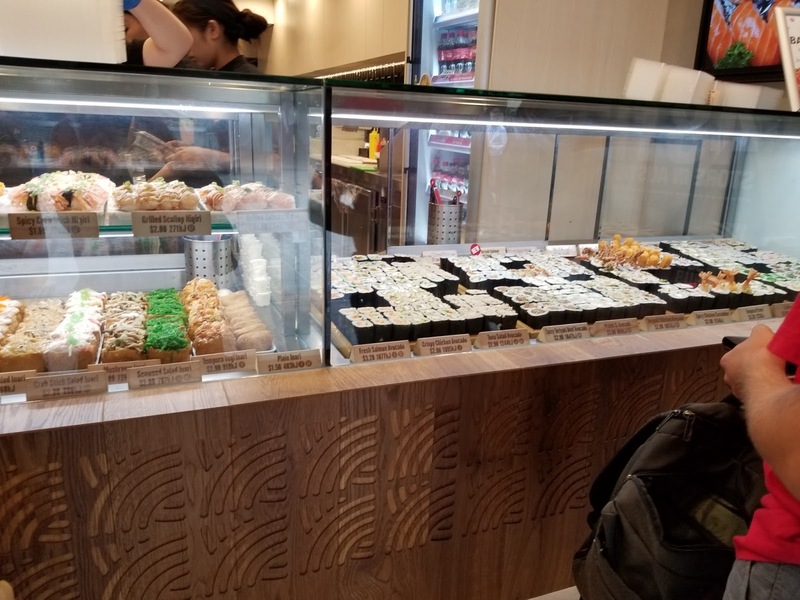 Service was very efficient, and super friendly despite the crowds during the lunch rush. 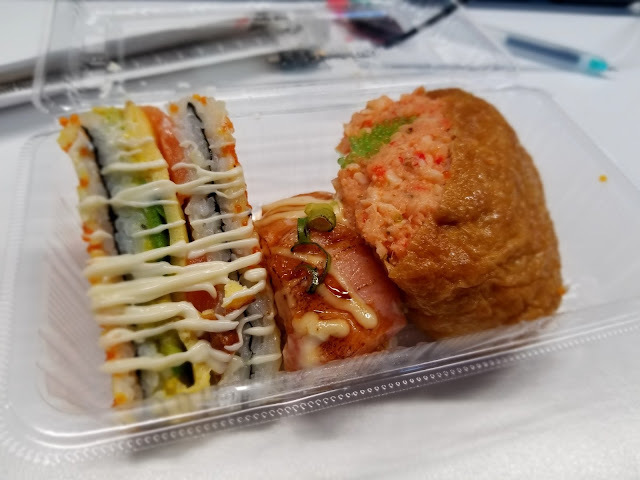 I had a sushi sandwich, a lobster salad inari and an aburi salmon nigiri. 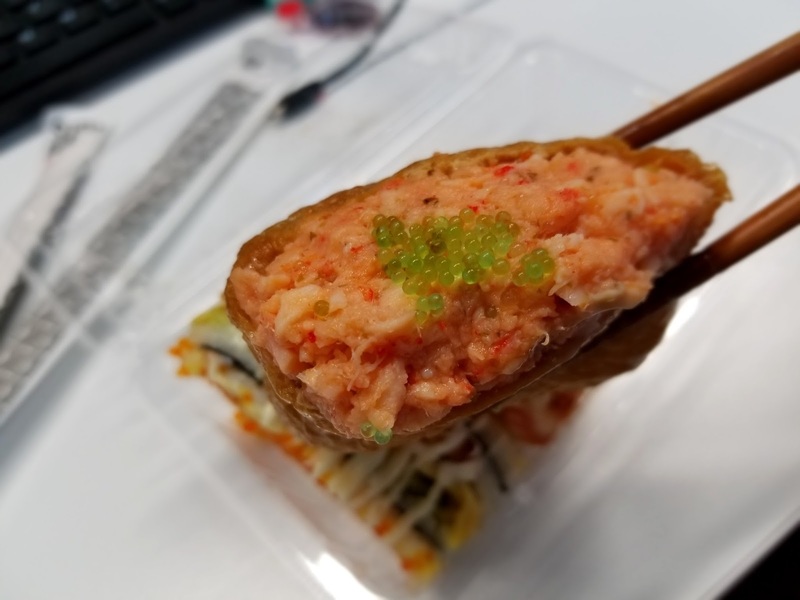 The Lobster Inari was bursting with flavour. 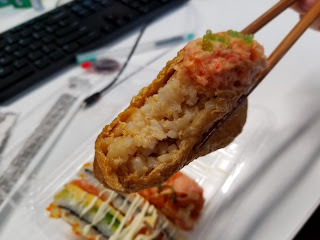 One bite and it had me hooked.The rice was well seasoned with a good amount of sushi vinegar, it had also absorbed a considerable amount of the soy marinade from the tofu skin. There wasn't a particularly large amount of lobster salad on top, but it was sufficient. The salad was rich and creamy and the added green tobiko on top gave it some much needed crunch. It was quite an ideal combination which I really enjoyed. The Aburi Salmon Nigiri was unfortunately not hot (can't really expect it to be hot after a trek through half the city with it), but like the lobster inari, it was very well seasoned. 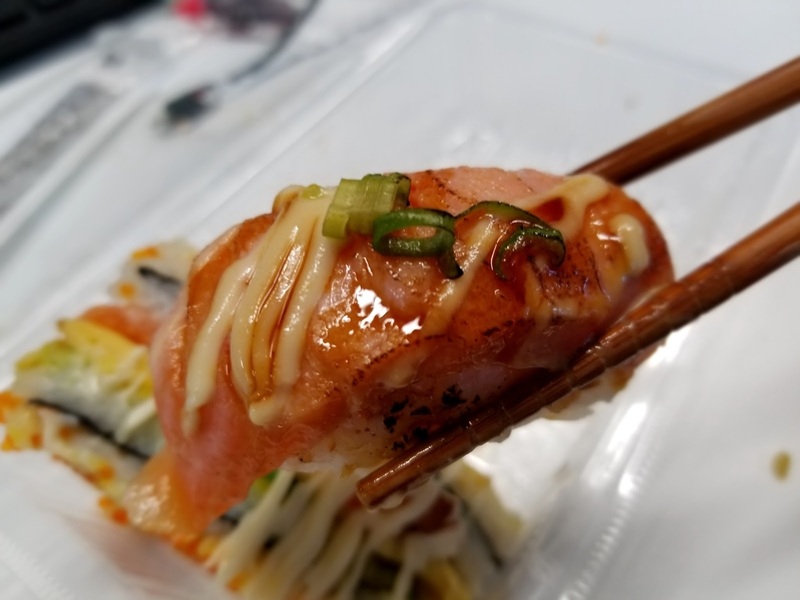 The salmon was cooked through completely and the onions and mayo were slightly charred which I quite enjoyed. Again, it was an explosion of flavours in my mouth, and it made me very happy. Last but not least was the sushi sandwich. 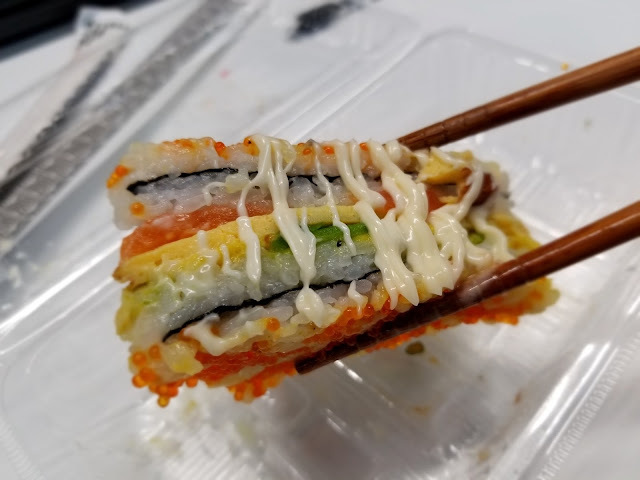 An innovative triangle comprising of seasoned rice, salmon, egg, avocado, nori and topped with tobiko and mayo. The combination of flavours was very complementary and the topping to rice ratio was quite ideal. I think I have found my new favourite sushi takeaway in the city.